An MIT project can track a user with an accuracy of +/- 10 centimeters. Massachusetts Institute of Technology researchers have developed a device that can see through walls and pinpoint a person with incredible accuracy. 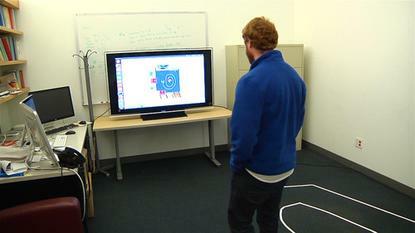 They call it the "Kinect of the future," after Microsoft's Xbox 360 motion sensing camera. Shown publicly this week for the first time the project from MIT's Computer Science and Artificial Laboratory (CSAIL) used three radio antennas spaced about a meter apart and pointed at a wall. A desk cluttered with wires and circuits generated and interpreted the radio waves. On the other side of the wall a single person walked around the room and the system represented that person as a red dot on a computer screen. The system tracked the movements with an accuracy of plus or minus 10 centimeters, which is about the width of an adult hand. See the system in action in a video on YouTube. Fadel Adib, a Ph.D student on the project, said that gaming could be one use for the technology, but that localization is also very important. He said that Wi-Fi localization, or determining someone's position based on Wi-Fi, requires the user to hold a transmitter, like a smartphone for example. "What we're doing here is localization through a wall without requiring you to hold any transmitter or receiver [and] simply by using reflections off a human body," he said. "What is impressive is that our accuracy is higher than even state of the art Wi-Fi localization." He said that he hopes further iterations of the project will offer a real-time silhouette rather than just a red dot. In the room where users walked around there was white tape on the floor in a circular design. The tape on the floor was also in the virtual representation of the room on the computer screen. It wasn't being used an aid to the technology, rather it showed onlookers just how accurate the system was. As testers walked on the floor design their actions were mirrored on the computer screen. One of the drawbacks of the system is that it can only track one moving person at a time and the area around the project needs to be completely free of movement. That meant that when the group wanted to test the system they would need to leave the room with the transmitters as well as the surrounding area; only the person being tracked could be nearby. At the CSAIL facility the researchers had the system set up between two offices, which shared an interior wall. In order to operate it, onlookers needed to stand about a meter or two outside of both of the offices as to not create interference for the system. The system can only track one person at a time, but that doesn't mean two people can't be in the same room at once. As long as one person is relatively still the system will only track the person that is moving. The group is working on making the system even more precise. "We now have an initial algorithm that can tell us if a person is just standing and breathing," Adib said. He was also able to show how raising an arm could also be tracked using radio signals. The red dot would move just slightly to the side where the arm was raised. Adib also said that unlike previous versions of the project that used Wi-Fi, the new system allows for 3D tracking and could be useful in telling when someone has fallen at home. The system now is quite bulky. It takes up an entire desk that is strewn with wires and then there's also the space used by the antennas. "We can put a lot of work into miniaturizing the hardware," said research Zach Kabelac, a masters student at MIT. He said that the antennas don't need to be as far apart as they are now. "We can actually bring these closer together to the size of a Kinect [sensor] or possibly smaller," he said. That would mean that the system would "lose a little bit of accuracy," but that it would be minimal. The researchers filed a patent this week and while there are no immediate plans for commercialization the team members were speaking with representatives from major wireless and component companies during the CSAIL open house.